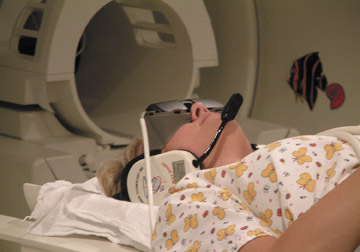 Obtaining high-quality images during a computed tomography (CT) or magnetic resonance imaging (MRI) examination requires patient cooperation, particularly in not moving during image acquisition. Many young children cannot cooperate with these requirements and need sedation for a high-quality CT or MRI to be obtained. Reducing the frequency of sedation for MRI and CT is important for multiple reasons, including patient safety, improving patient and family satisfaction, easing patient flow through the CT and MRI suites, and cost considerations. Although radiology sedation programs have excellent safety records and excellent success rates, 1-3 it is almost always safer to perform the required study without sedation. Avoiding sedating a child for an imaging procedure may save parents significant anxiety and thus improve the patient and family experience. Avoiding sedation and the subsequent time for recovery from sedation will significantly shorten the length of the hospital visit, which is another favorable benefit. Reducing the frequency with which sedation must be administered to patients allows for improved and more efficient patient flow through the CT and MRI suites. Finally, avoiding sedation decreases the overall procedure-related expense. In view of the multiple benefits in reducing the need for sedation of children undergoing CT and MRI, our department launched a process-improvement initiative in this area. 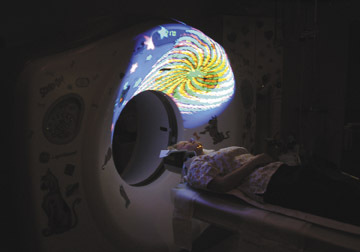 The sedation reduction program consisted of multiple components, including hiring a certified child-life specialist, installing MRI video goggles, adding a DVD player with a flat-screen monitor on a multijointed arm in the CT room, installing a moving color light-show device in CT, and instituting a "culture change," emphasizing the need to avoid sedation in children for CT and MRI whenever possible. We assessed the incidence of requiring sedation before and after the institution of this program. 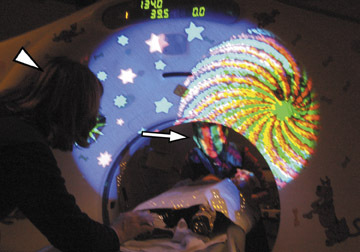 Components of the sedation reduction program for CT and MRI were instituted sequentially during the course of a year within a large, tertiary, freestanding children's hospital. At the time of the study, the department operated 5 clinical MRI scanners and 2 CT scanners. Certified child-life specialist- A certified child-life specialist was hired to prepare, coach, distract, and support children in an attempt to increase the likelihood that a child would be able to cooperate during the acquisition of CT or MRI studies without sedation (Figure 1). MRI video goggles- MRI video goggles (MR Vision 2000, Resonance Technology Inc., Northridge, CA) (Figure 2) were used in each of our 5 clinical MRI scanners. Children can wear the video goggles to watch and listen to movies as a distraction during MRI acquisition. Digital video disk (DVD) player with flat-screen monitor on mobile arm- Our institution designed and implemented a DVD player with a movable screen (Figure 3). 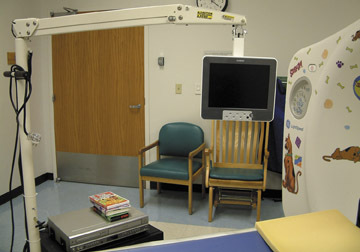 The movable arm has multiple joints, which allows a child to watch a video regardless of whether they are placed prone, supine, or head- or feet-first in the scanner. Color light-show device- A color light-show device (Snoezelen, ROMPA Ltd., Chesterfield, UK) was purchased that projects a moving color picture on the CT gantry or room ceiling (Figure 4). The moving images often distract and calm infants and young children, which may improve their ability to cooperate with CT scanning. Culture change- The importance of avoiding sedation whenever possible was stressed to the radiology faculty, nursing staff, and technologist staff. A goal for reducing sedation was established and displayed publicly on the Department of Radiology scorecard, with quarterly updates. In order to assess the utility of this program, records from all CT and MRI examinations that were obtained in children younger than 7 years were reviewed. The frequency of sedation for the entire group of children as well as for each specific age was determined. For the year prior to initiating our program (July 2002 to June 2003), there were a total of 3858 CT examinations and 2366 MRI examinations performed on children younger than 7 years. During the first year that the program was fully implemented (July 2004 to June 2005), a total of 3615 CT examinations and 2996 MRI examinations were performed in children younger than 7 years. A comparison of frequency of sedation between the 2 groups is summarized for MRI in Table 1 and for CT in Table 2. Photographs showing the different interventions are shown in Figures 1 through 5. For MRI examinations, there was a 34.6% decrease in the frequency of sedation ( P <0.001), from 80.8% prior to the program to 52.8% during the program. For CT examinations, there was a 44.9% decrease in the frequency of sedation ( P <0.001) from 27.1% prior to the program to 14.9% during the program. All individual age groups younger than 7 years showed a statistically significant decrease in the frequency of sedation with the exception of children aged 6 to 7 years in the CT comparison (Tables 1 and 2). The 6- to 7-year-old group in the CT comparison did not show a statistically significant change ( P = 0.077), even though the actual reduction was 50.4%, one of the highest in this study. The reason for the lack of statistically significant change in the older children undergoing CT is likely caused by the very low frequency of the use of sedation in children of this age prior to the program. We also surveyed patient families about their experience in the CT and MRI departments. Of those surveyed, approximately half of the families who had a previous experience in either CT or MRI believed that their experience after implementation of the sedation frequency reduction program was better than their visit prior to the program introduction. The majority of the remaining families surveyed thought the experience was unchanged. It is the subjective opinion of our radiology administration that the presence of the child-life specialist has had a profound effect on patient and family satisfaction. We received a greater number of unsolicited complementary letters from patient families related to the presence of the child-life specialist than about any other aspect of our department. A program instituted to decrease the frequency of pediatric sedation can have a positive effect on a CT and MRI service. In the authors' program, there was a 34.6% reduction in the need for sedation among children younger than 7 years undergoing MRI and a 44.9% reduction for those undergoing CT. Both effects were statistically significant ( P = 0.001). The influence of the total program was assessed rather than the contributions of individual components. In fact, the child-life specialist was one of the key components of the program; other components, such as the moving light show and DVD player, were utilized as tools by the child-life specialist. The relative contributions of individual program aspects, such as the child-life specialist, DVD player with flat-screen monitor, moving light show, and MRI video goggles cannot be ascertained from our experience. In particular, the study does not allow us to gauge the influence of the "culture change" created by the administration, with stress on the importance of lowering the frequency of sedation and in publicly displaying data on this parameter on the radiology scorecard. This experience in our practice indicates that for CT and MRI, both before and after implementation of this sedation reduction program, the 1- to 2- and 2-to 3-year-olds had the highest frequency of requiring sedation (Tables 1 and 2); yet, even in this group, a statistically significant decrease in sedation occurred although it was less than that seen in other age groups. Infants can often be induced to sleep by feeding, providing warmth, and swaddling in blankets. Children older than 3 years of age are, in general, more apt to be able to cooperate. Some children who require sedation may be less likely to benefit from the techniques described, including some patients with behavioral problems, mental retardation, developmental delay, movement disorders, and visual impairments. The purpose of our program was to decrease the use of pediatric sedation and, thus, improve the quality of and satisfaction with the pediatric MR and CT services at our own institution; and this has been achieved. Development of similar programs, perhaps with specific modifications for a given setting, may create even more benefit. To succeed, however, there must be uniform support for the effort among all members of the staff involved. Many potential benefits will accrue to the hospital, the staff, and the patients and their families if such a program is instituted. 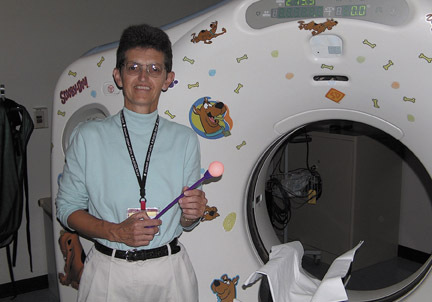 A program to decrease the need for pediatric sedation for CT and MRI. Appl Radiol. Mr. Khan is a Research Assistant and a Medical Student, Dr. Donnelly is the Radiologist-in-Chief, Dr. Koch is an Associate Director of Radiology, Ms. Curtwright is the Senior Nursing Clinical Director, Ms. Dickerson is the Compliance and Education Coordinator, Ms. Hardin is an Application Specialist, Ms. Hutchinson is the Director of Finance, and Mr. Gessner is an Associate Vice President, Cincinnati Children's Hospital Medical Center, Cincinnati, OH.